This publication serves as a reference for producers regarding options of carcass disposal. Animal mortality losses are a normal part of livestock and poultry production facilities. Producers may have losses due to disease, accidents, inter-animal competition or natural disasters such as flooding or blizzard. They need to think about mortality management before a death occurs to avoid having problems after the fact. The producer is responsible for disposing of these mortalities within 48 hours in an environmentally acceptable manner. Carcass abandonment is not considered an acceptable disposal practice. Safe disposal of carcasses is an important issue for day-to-day, routine management of livestock and poultry mortalities to prevent disease transmission and to protect air and water quality. Therefore, carcass disposal remains one of the major problems facing livestock and poultry producers. Owners and operators of animal feeding operations (AFOs) have several options for disposing of mortalities, including rendering, incineration, burial and composting. Each option has a set of advantages and disadvantages that must be considered during planning for and prior to mortality disposal. Producers must take special precautions with the disposal of diseased animals because states may have stricter and different mortality handling and disposal requirements pertaining to certain infectious diseases. The following is a brief discussion of each disposal option. Contacting your local regulatory agency to determine what regulatory requirements may need to be met before adopting any of the following options also is helpful. Rendering is the process of converting animal carcasses to pathogen-free, useful byproducts such a feed protein. In the process of rendering, the carcasses are exposed to high temperatures (about 130 C or 265 F) using pressurized steam to ensure destruction of most pathogens. However, rendering poses biosecurity concerns due to the transportation of livestock mortalities to multiple locations en route to the rendering plant (Fonstad et al., 2003). The rendering market has changed in recent years because the price of meat and bone meal has decreased and the use of many rendered byproducts has been eliminated due to concerns related to transmissible bovine spongiform encephalopathies (BSE or mad cow disease). Since 2005, cattle infection with the BSE disease has had a highly negative impact on the industry. The Food and Drug Administration (FDA) requires removal of brain and spinal cord specified risk material (SRM) from rendered products intended for animal food. The vertebral column and spinal cord of cattle 30 months and older are considered to be SRM. This makes rendering animal carcasses harder and more expensive. This FDA regulation is aimed at protecting against the transmission of transmissible spongiform encephalopathies such as BSE, but rendering facilities charge additional fees for the processing requirement. In addition, rendering might not be an option for some producers, depending on location, type and volume of mortalities. In North Dakota, in the case of any infectious or contagious disease, a carcass must be disposed of within 36 hours or transferred to a licensed rendering plant. However, large distances between rural areas and rendering plants and the lack of a timely pickup service of dead animals from farms are the biggest challenges for using rendering as a mortality disposal method. In many areas, the numbers of rendering facilities are limited and in many cases are declining due to increased costs and biosecurity risks associated with transporting mortalities (Glanville et al., 2009). Incineration is the thermal destruction of carcasses by auxiliary fuel such as propane, diesel or natural gas. Modern incinerators reduce carcasses to ash and generally are biosecure. Incineration requires a great deal of energy, compared with other disposal methods, and is not considered a viable economic disposal option due to cost and labor. Incineration is a preferred method for managing small carcasses (for example, poultry and swine), but often large carcasses and/or a large number of mortalities cannot be handled due to the small incineration capacities (mostly are limited to less than 300 pounds per head) of most on-site farm incinerators. The capital cost of incineration may be a limiting factor for some producers, but poultry and small-livestock producers may find incineration to be a convenient option to dispose of mortalities as they are generated, eliminating the need for temporary storage. However, regular cleaning and maintenance are required to keep the incinerator functioning properly. Also, incinerators must be loaded and operated according to the manufacturer’s recommendations. Odor nuisance complaints generated due to a poorly functioning incinerator are common. Burning carcasses in a pit on the site is an acceptable method of disposal in North Dakota. Open-pit or open-pile burning should be a method of last resort. Consider personnel and property safety and choose a proper location away from the public view. Refer to the “Burial” section on choosing an appropriate location. Be sure the carcass is burned as soon as it is discovered and it burns completely. North Dakota state law requires anthrax-infected carcasses be incinerated or buried at least 6 feet deep on the same site where they died if possible. Find the complete procedure in the NDSU Extension publication “Anthrax”. Hogs that have died from hog cholera or swine erysipelas also must be burned on site within 36 hours. Burial is a common method of carcass disposal to manage mortalities, but it poses a groundwater contamination risk if the burial site is not selected and managed properly. Therefore, selection and maintenance of a burial site is very important. For example, areas with sandy or gravelly soil and a shallow groundwater table must not be used as burial sites. In North Dakota, the bottom of the disposal trench must be 4 feet above any permanent water table, and the trench must be a minimum horizontal distance of 200 feet from the nearest surface water. Also, the disposal site should be away from any residence, drinking water well, shallow aquifers or areas that may be flooded. Often, excessive pollutants can build up in burial sites, and leaching of nitrogen and phosphorus into water bodies causes eutrophication (Turan et al., 2007). From a biosecurity point of view, burial is a viable option. But the challenges of disposal by burial may include identifying suitable on-farm burial sites due to the risk of groundwater contamination. Prompt burial will prevent nuisance problems such as odors, flies and scavengers. On-farm burial might be the quickest way to dispose of nondiseased animal mortalities. The disposal trench bottom should be compacted and mortalities should be placed in 3- to 4-feet layers in the disposal trench. A layer of 6 to 12 inches of soil can be placed between layers of carcasses. The trench should be covered with soil mounded to shed rainwater, and the mound should be inspected periodically for settling or caving. Anyone burying dead livestock needs to take personnel and equipment safety precautions during trench digging, carcass handling, placing carcasses in the trench and backfilling the trench with soil. Burial is difficult during winter and not an option during flooding or in areas prone to flooding. Livestock owners may find that digging a long trench in the summer for animal carcass burial during winter is economically advantageous because the excavation of frozen soil may be impossible. A dead animal may be placed at one end of the trench and covered with soil. When another carcass needs to be added, the carcass can be placed in the trench immediately and covered even if the ground is frozen. Livestock owners need to take proper precautions, such as fencing the trenched area, with this system because an open trench can be a safety hazard. Composting is a naturally occurring process in which the dead animal is broken down into basic elements (organic matter) by microorganisms, bacteria and fungi. Composting has advantages over other methods of carcass disposal, including lower costs, easy-to-prepare piles and windrows created with available on-farm machinery, and lower risk of air and water pollution when done properly. Composting has gained popularity in areas where burial and incineration are not practical or have become restricted. Proper composting techniques will destroy most disease-causing bacteria and viruses. Composting of carcasses is recognized as an effective method by the biosecurity agencies in the U.S. and other countries to manage routine and emergency management of mortalities (Wilkinson, 2007). Composting is the preferred method of carcass disposal because it can be implemented rapidly on farms at minimum cost. However, selection of a proper composting site is important to prevent surface water runoff to the compost site and runoff of leachate from the compost site, as well as leaching of raw or finished compost nutrients to groundwater. Similarly, proper maintenance of compost piles or windrows (for example, temperature between 90 and 140 F, moisture ranges between 50 and 60 percent on a wet basis, carbon-to-nitrogen ratio ranges between 20:1 and 25:1, turning) is required to avoid anaerobic (without oxygen) conditions during the composting process that can contribute to odor issues and greenhouse gas emissions, including methane (CH4) and nitrous oxide (N2O) (Hao et al., 2001; Xu et al., 2007). Typically, compost thermometers (36- or 48-inch stem length) or wireless/wired temperature probes should be inserted at an 45-degree angle to 18 and 36 inches in depth in the compost piles for monitoring pile temperature above and below the carcasses layer. In case of highly pathogenic avian influenza (HPAI), a remote temperature monitoring is preferable (Flory et al., 2009). Carcass composting typically is done in one of three primary facility types: a bin, a static windrow or a minicomposter (Keener et al., 2000). As per 2016 U.S. Department of Agriculture-HPAI response mortality composting guidelines, suitable carbon sources are key for proper windrow or pile preperatrion and maintaining a consistent temperature during composting. Some of the suitable carbon sources are wood chips about 2 inches or less, wood shavings, yard/brush trimming less than 2 inches, chopped hay/straw, chopped corn stover, oat/sunflower hulls, ground pallets and manure with no previous concerns. Each of these options is described briefly in the following sections. Small and medium-sized carcasses can be composted in a three-sided enclosure (for example, a bin) constructed on compacted clay soil or a concrete floor (Figure 2). At least three bins usually are in operation at any time. As one bin is being filled, another is in the primary stages of composting and the third is in the secondary stages (secondary heat cycle) of composting. A base of sawdust, wheat straw, or other suitable carbon source 12 to 18 inches in depth is required, depending on carcass size. Suitable carbon sources vary, but may include straw, waste feed/hay, sawdust, poultry litter or finished compost. Often, during the carcass composting process, liquid may drain from the composting pile; the liquid needs to be contained. 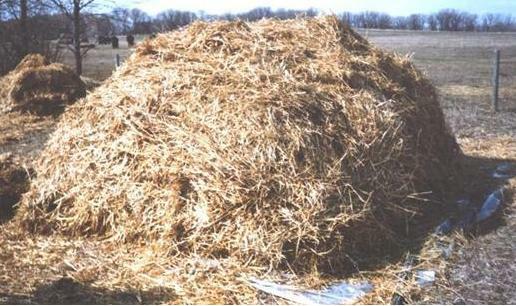 A dry and absorbent base material (for example, hay or straw, finished compost, sawdust) can be used to capture liquid draining from the composting pile (Auvermann, 2006). The bulking material, such as cornstalks and tree trimmings, needs to provide porosity and structure to a compost pile; therefore, manure is not the ideal choice. Manure may be used if enough bedding is incorporated with it. Carcasses are layered in the bin with a suitable carbon source between each layer. Make sure no part of a carcass is exposed; otherwise, predators will be attracted to the site. Typically, a minimum 12- to 16-inch layer of co-composting material around all sides of the carcass will discourage predators, control odors and eliminate flies. As a general guide, 3 to 5 cubic yards of co-composting material is required for every 1,000 pounds of carcass (Auvermann et al., 2006). Roughly, the total carbon = pounds of birds × 1.5. Materials are turned using a bucket loader. The turning operation mixes the composting materials and enhances passive aeration. Typically, turning frequency should be based on pile temperature, and turning should occur when the compost pile temperature exceeds 140 F or drops below 90 F.
A conventional pile and windrow composting system is a better method for large animals (for example, mature cattle or pigs). Piles and windrows for mortality composting usually are constructed in the open on a compacted soil (for example, clay soil) or a concrete floor to control water infiltration. In pile or windrow composting, typically walls and roofs are not used to ease access for loading, unloading and mixing of the pile or windrow from all sides , (Figure 3). Windrows are aerated primarily via natural air movement or passive air movement (Rynk, 1992). A conventional composting pile is managed vigorously in the beginning to maintain aerobic and thermophilic conditions (greater than 105 F) to encourage rapid rates of decomposition, elimina- tion of objectionable odors, and the destruction of pathogens and weed seeds (Wilkinson, 2007). However, during mortality composting, piles are left undisturbed during the first stage of composting (phase I) to ensure soft tissue is decomposing properly. For small- and medium-sized carcasses (for example, poultry, pigs, sheep) the active composting period (phase I) may be up to three months before the pile is turned (Keener et al., 2000). However, for a large carcass (mature beef and dairy cattle, horses or other large animals), the active composting phase may be up to six months (Auvermann, 2006). Following the active composting phase, additional time (days to weeks, depending on composting conditions) may be needed for small- and medium-sized carcasses to complete decomposition (phase II), while large carcasses may require months. Turning the pile mixes the materials and rebuilds the porosity of the windrow. However, frequent turning of an active compost pile during a disease outbreak may increase the risk of generation and release of airborne particulates that can carry infectious microbes (Xu et al., 2009). Small-scale turning typically is done by a front-end loader or bucket loader, but large-scale turning is done by a tractor-assisted windrow turner. 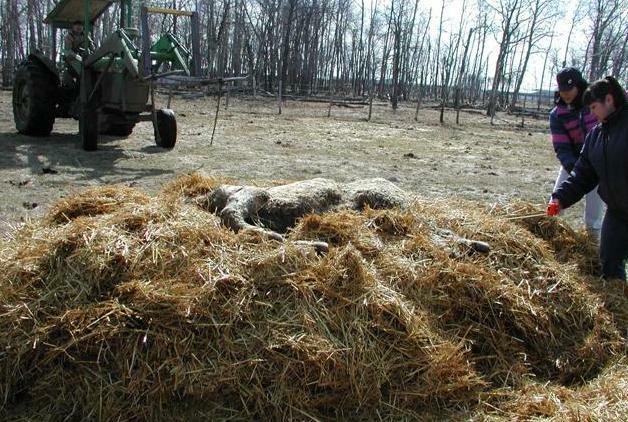 Small and medium-sized carcasses can be placed in layers in windrows, but large carcasses (for example, cattle, horses) need to be placed in a single layer (Figure 3). Place the mortality on the base material. 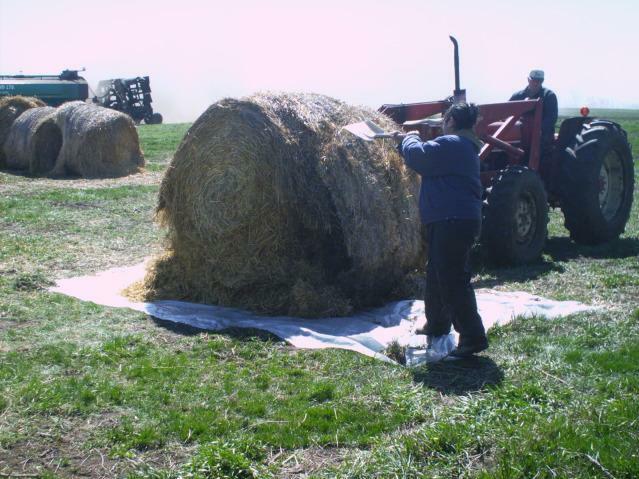 Cover the carcass with 8 to 10 inches of bulking material and cover that with another 1 to 2 feet of cover material (same as the base material) to make up the cover. The cover material may settle or be disturbed by wind, so be sure to check the pile periodically. If you notice excessive odors, add more cover material to the outside of the pile. Due to placement and handling limitations of large carcasses, composting may not be practical to consider during a massive infectious disease outbreak. Placing a fresh (warm) carcass in a compost pile will help speed the decomposition process versus placing a cold carcass in the pile. Also, starting a fresh compost pile in the winter will add significantly to the time needed to finish composting a large carcass because of the additional time the microorganisms will take to produce adequate heat. Nonetheless, wintertime composting is still a viable option as opposed to digging into the frozen ground. Figure 3. This is a step-by-step look at the composting pile construction procedure: finishing the pile with adequate straw surrounding the carcass. Minicomposters are used for small-carcass (for example, poultry) composting and are not suitable to handle large volumes of animal mortalities. For a northern climate, additional insulation might be required to reach the desired temperatures for pathogen destruction and effective degradation (Keener et al., 2000). Also, higher capital investment is required. Overall, a major advantage of composting is that the final product can be used as a nutrient source on fields, but proper management is needed. Producers have several options for disposing of carcasses, including rendering, incineration, burial and composting. The choice of disposal options depends on location, availability of raw materials or equipment and services, affordability and limitations on properly protecting the environment. Carcass composting is considered one of the best disposal options due to its greater affordability, better biosecurity and low inputs and investment requirements, but composting needs proper management for complete decomposition and to ensure that objectionable odors are not generated. Complete destruction of pathogens and weed seeds occurs by maintaining thermophilic conditions during the active composting period. If done properly, composting animal carcasses is an environmentally safe disposal option to manage emergency mortalities that do not require very high temperatures for complete destruction of transmissible diseases such as BSE. Berg, M., Brummund, P., Harstad, A., and Nester, P. 2015. 5 easy steps for composting dead livestock. NDSU Extension Service publication AS1781. Flory, G.A., Peer, R.W., and Malone, G.W. Guidelines for in-house composting poultry mortality as a rapid response to avian influenza. Virginia Coperative Extension. Fonstad, T.A., Meier, D.E., Ingram, L.J., and Leonard, J. 2003. Evaluation and demonstration of composting as an option for dead animal management in Saskatchewan. Canadian Biosystems Engineering. 45: 6.19 - 6.25. Glanville, T.D., Ahn, H.K., Richard, T.L., Shiers, L.E., and Harmon, J.D. 2009. Soil contamination caused by emergency bio-reduction of catastrophic livestock mortalities. Water Air Soil Pollution. 198: 285-295. Hao, X., Chang, C., Larney, F.J., and Travis, G.R. 2001. Greenhouse gas emissions during cattle feedlot manure composting. Journal of Environmental Quality. 30: 376-386. Keener, H.M., Elwell, D.L., and Monnin, M.J. 2000. 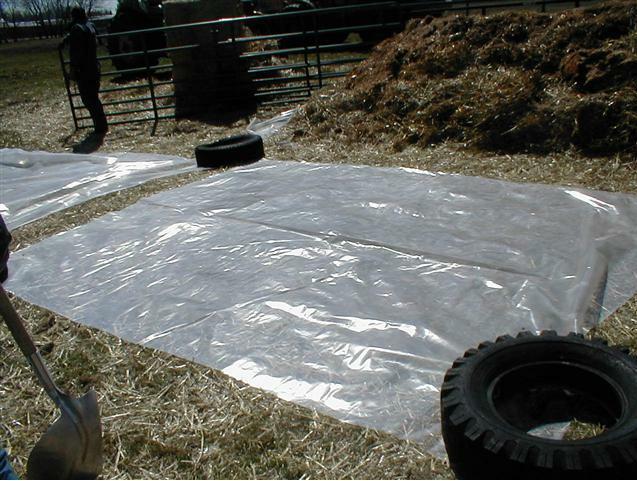 Procedures and equations for sizing of structures and windrows for composting animal mortalities. Applied Engineering in Agriculture. 16: 681-692. Mukhtar, S., Nash, C., Harman, W., and Padia, R. 2008. How much does that incinerator cost? AgriLife Extension Bulletin, Texas A&M University, B-6209. Rynk, R.F. 1992. On-farm composting handbook/editor: Robert Rynk [et al.]. Ithaca, N.Y.: Northeast Regional Agricultural Engineering Service (NARES). Stoltenow, C.L., and Hammer, C.J. 2009. Anthrax. NDSU Extension publication V561. Turan, N.G., Akdemir, A., and Ergun, O.N. 2007. Emission of Volatile Organic Compounds during Composting of Poultry Litter [electronic resource]. Water, Air, and Soil Pollution. 184(1-4): 177-182. USDA-HPAI 2016. Mortality composting: carbon sources for windrow construction. Wilkinson, K.G. 2007. The biosecurity of on-farm mortality composting. Journal of Applied Microbiology. 102(3): 609-618. Xu, S., Hao, X., Stanford, K., McAllister, T., Larney, F.J., and Wang, J. 2007. Greenhouse gas emissions during co-composting of calf mortalities with manure. Journal of Environmental Quality. 36: 1914-1919. Xu, W., Reuter, T., Inglis, G.D., Larney, F.J., Alexander, T.W., Guan, J., Stanford, K., Xu, Y., and McAllister, T.A. 2009. A biosecure composting system for disposal of cattle carcasses and manure following infectious disease outbreak. Journal of Environmental Quality. 38: 437-450. This publication was authored by Shafiqur Rahman, associate professor, NDSU; Teresa Dvorak, former NDSU area livestock nutrient management specialist; Charlie Stoltenow, NDSU Extension Service assistant director, agriculture and natural resources; and Saqib Mukhtar, former associate professor, Texas AgriLife Extension, 2009.